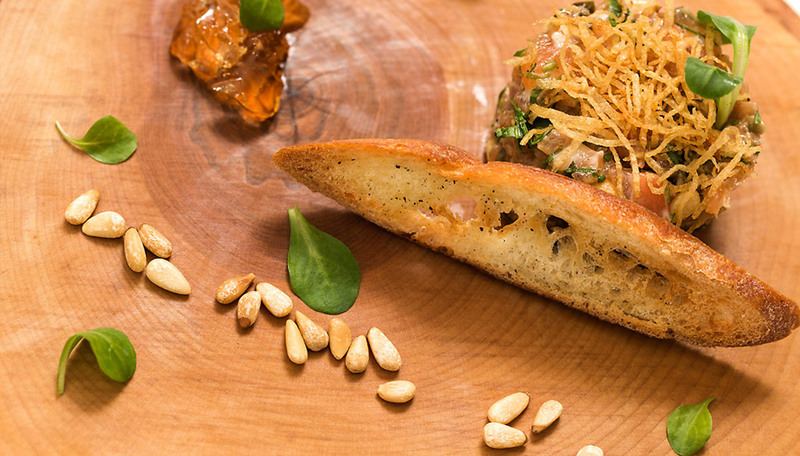 This trendy bistro has become one of the most popular restaurant in Quebec city and enable the well-renowned chef Jean-Luc Boulay and his accomplice, Arnaud Marchand, to offer to a large public a nordic-inspired cuisine that features regional products and that is adapted to the different seasons. More specifically, it is a healthy and tasty cuisine where sous-vide cooking and cocotte-style presentation are in the spotlight. As a reminder, Chef Arnaud Marchand was one of the 2 finalists in the 2010 season of Les Chefs tv serie during which Chef Jean Luc Boulay, acting as a judge, was able to see and appreciate his potential. Rich in essential nutrients, like monoinsaturated oils with a high content of omega-3 and omega-6 fatty acids. Fish has an important place in nordic cuisine which uses either lean fish that are rich in proteins such as cod, or with a high content of beneficial omega-3 fatty acids, such as salmon, trout or mackerel. Game meat is very rich in high quality proteins and has almost no saturated fats. Nordic cuisine makes use of vegetables and berries rich in vitamins B and C and in antioxydants. Nordic cuisine is based upon responsible cultivation, harvesting and consumption. Its a good way to get closer to our roots by reapproprieting products that are unique to our nordic climate. 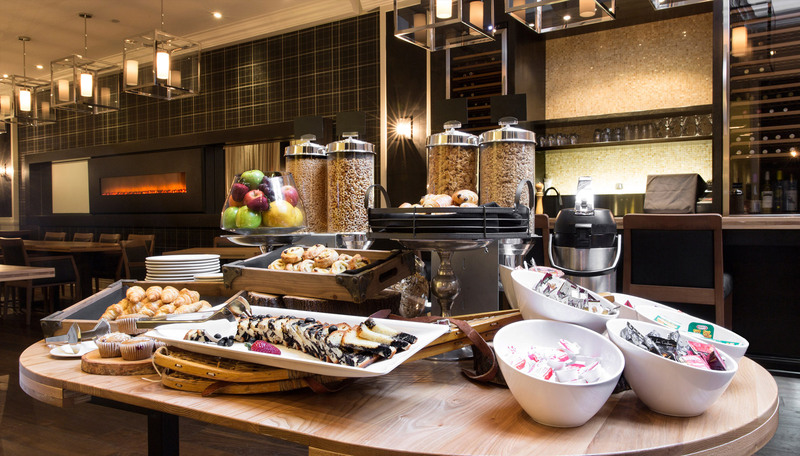 "La Table du Manoir » offers you sunshine in your plate every morning." In is native France, Jean-Luc has started his apprenticeship at the age of 15 and has obtained a certificate of professional skills in cuisine (CAP) in 1973. He had the privilege to work with a trainer who saw his immense potential and presented him with various training opportunities. Every Friday, he would take Jean-Luc to the fish market to teach him to distinguish the best sea fish catches from the less fresh pieces. Each night, after service, he makes him taste a new wine to learn the basics of wine tasting and the importance of knowing the pairing of wine and food. Jean-Luc will then do different jobs in cuisine to add to his experience while doing his military service as a cook at the Officers Mess. In 1976, already passionate of travel and discoveries, Jean-Luc Boulay acquires a permanent work visa for Québec and becomes the Chef of restaurant Le Boeuf Charolais of Loews Le Concorde Hotel where he meets the love of his life: Linda Therrien. She will become his accomplice, his associate, his travel partner, his inspiration and his most severe critic and admirer. They have three children together and two grand-children. In 1978, Jean-Luc meets Jacques Fortier who makes him the proposal to open a new restaurant in Old Québec. The French restaurant Le Saint-Amour offers a diversified high quality cuisine at great price value and is an instant hit. Refusing to rest on their laurels, the two partners will work relentlessly with the support of their loyal employees and their families to constantly improve all facets of their operation to reflect Jean-Luc’s passion for culinary art. To nourish his passion and perfect his art, each year, starting in the 80’s, Jean-Luc would attend the most renowned culinary schools (Le Nôtre in Paris, Cacao Barry in Meulan, seminars in Italy…). The goal of the two associates to stay on top of all new culinary trends and techniques and to bring this knowledge to the plates of Le Saint-Amour restaurant will result in making it a gastronomical destination not to be missed in the early 90’s. From now on, the distinctions and honors will surge. In 2003, Jean-Luc Boulay is awarded National Chef of the year by The Society of Pastry Chefs and Cooks of the Province of Québec after having been crowned three times as best Chef of his region. Then, in 2010 he received the Mérite Agricole de France medal, the Governor General’s Award in Celebration of the Nation’s Table recognizing the importance of his work as a mentor and as an ambassador of the Canadian gastronomy. They also had the honour of welcoming and serving international stars like Sting, Paul McCartney and Johnny Halliday. His great friend, Chef Jérôme Ferrer from Europea Group (Relais et Châteaux) invited him to enter the pantheon of this prestigious association of great professional Master Cooks of France. Jean-Luc Boulay is also member of several renowned gastronomic associations such as Les Disciples d’Escoffier. Besides developing his restaurant, Jean-Luc Boulay has participated to many gastronomic events (Japan, Kuala Lumpur, Belgium, Singapor, Spain, Vancouver Olympic Games, Martinique etc.) 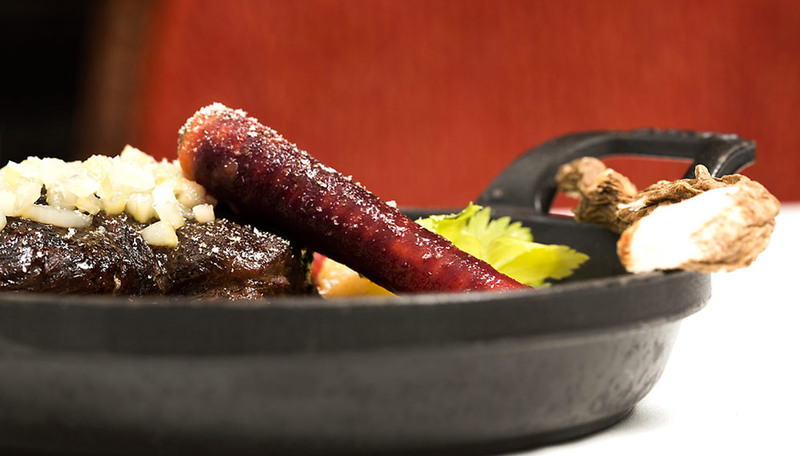 to present Québec’s regional products and local cuisine. He is also very passionate about training successors by giving different seminars on “sous-vide” cooking, cold cut meats and foie gras, while supervising the rigorous training of the apprentices and professionals eager to participate to different competitions in Québec and abroad. Volunteering is a part of his nature and he supports a lot of charitable organizations such as La Fondation Serge Bruyère, Adaptavie, The Red Cross, Young musicians of the World and writing a book on how to cook with ingredients against cancer etc. If he has participated in creating a lot of cooking books during the last few years, “The Gourmet World of Jean-Luc Boulay” is the first book of his own. Native of France, Arnaud defines himself as discreet, enthusiast, disciplined and perfectionist person. According to him, there is nothing more rewarding than hearing from a waiter that a customer adored his dish! Arnaud is a man of integrity and he can sometimes be hard on himself. He loves challenges and seeks constant improvement. He is ambitious and he knows what he wants. With a little more than 10 years of experience, Arnaud believes that his passion for cooking has been transmitted by Mr Alain Beaudoux, the first Chef he worked with at restaurant Le Pont de Raffiny in France in the first years of his career. After this first inspiring experience, Arnaud made the decision to pack his bags to do the seasons in France. He therefore worked in restaurants that are opened only for a season, that is, Summers in the South of France and Winters in the mountains. His journey in various restaurants lasted eight years. In Spring of 2010, he participated in the first season of Les Chefs culinary competition on CBC where he went to finale. This beautiful adventure allowed him to meet famous Chef Jean-Luc Boulay. 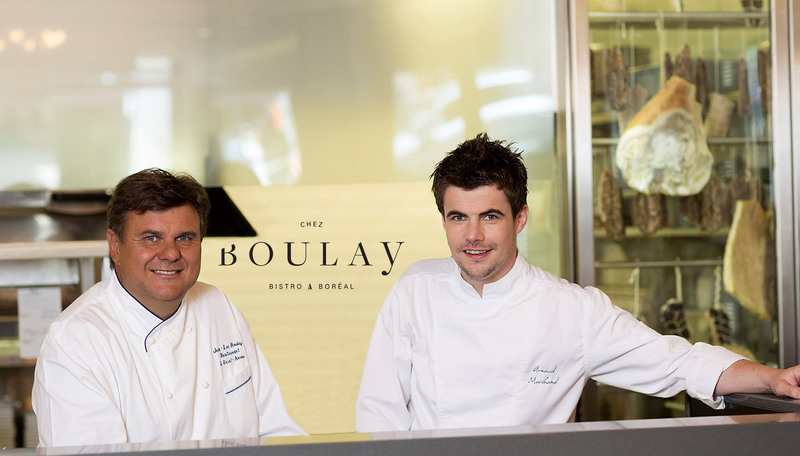 In Spring of 2012, the two developed a friendship which transformed into a business partnership leading to the opening of the new restaurant Chez Boulay – Bistro boréal. This new concept of Nordic inspiration allows Arnaud to develop menus based on the seasons with Canadian products. The perfectionnist nature of Arnaud pushes him to endelessly find sources of improvement and new challenges. 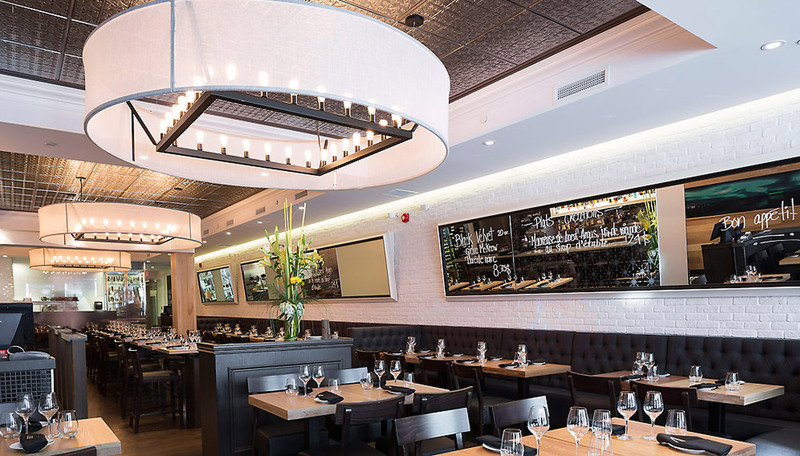 It pays off as the popularity of the bistro has grown since the opening to be today recognized as one of the best restaurants in Quebec city, already blessed with a vibrant gastronomic scene. After being recruted as a guest chef at Ricardo's tv show Un chef à l'oreille, Arnaud decides to develop his own tv show The cuisine par Arnaud Marchand and his website arnaudmarchand.com in order to continue in his mission to promote the Nordic cuisine . He launches at the same time a trio of signature boreal spices ( poultry-meat-fish) and pre-spiced sauces for fish and meat tartar. In 2015, his talent and hard work are recognized by L'Association des restaurateurs du Québec who designates him as Young restaurant owner of the year and was also crowned Chef of the Year by La société des chefs et pâtissiers du Québec. In December 2016, Arnaud opens Le Comptoir Boréal next to the Hotel Manoir Victoria main entrance. 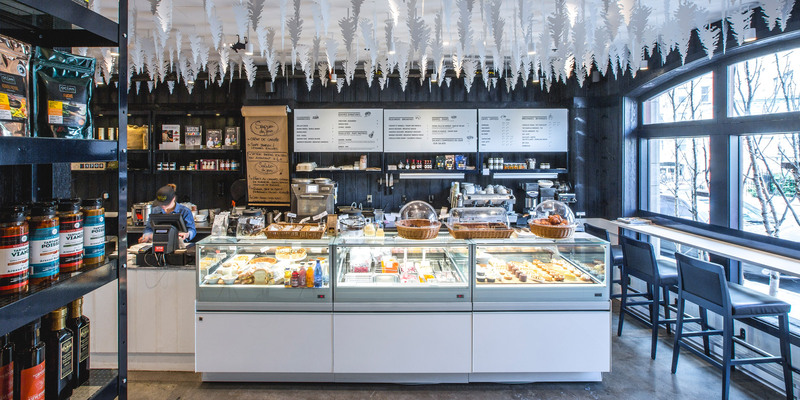 This new cafe and boutique is a true boreal laboratory, serving pastries, coffees, sandwiches, to-go prepared dishes and local products. It can also seat 10 people who can watch the artwork of the pastry chefs through the open kitchen preparing the great desserts offered at the bistro and the comptoir, a great introduction to the unique concept of Chez Boulay-bistro boréal. In May 2017, Arnaud publilshes a recipe book with chef Jean Luc Boulay : Garde manger boréal (or Boreal pantry), designed to inspire food lovers to discover local products and flavors in order to use them in their own home-cooking. One project after the other... will lead him to new honors as a 2017 finalist in the category "services and small business" at the Gala des Fideides organized by the Quebec industry and commerce chamber. Despite a very busy schedule, Arnaud finds the time to participe pro-bono in different charities such as Autisme Quebec and Operation Enfant-soleil as it is important to him to nourish body and soul. Arnaud and his wife Sophie, also his business partner, have three young sons to cherish and love. 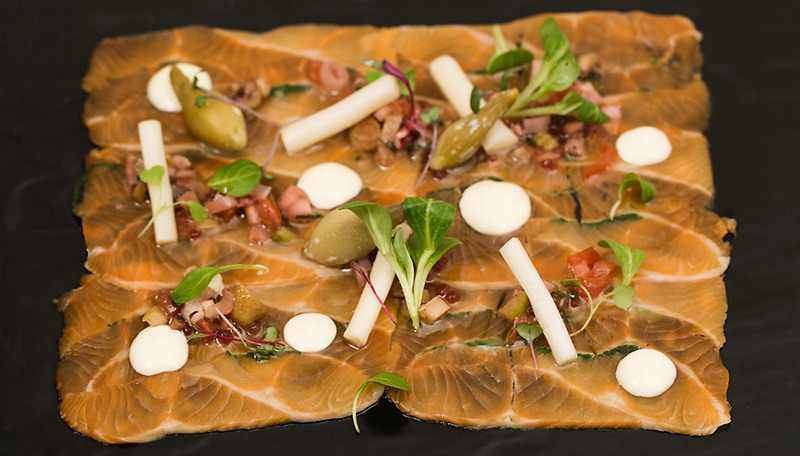 Visit the official website of Chez Boulay - bistro boréal! Take a look at all the menus ! Breakfast (Not applicable for room service).